The Artisan/Craft Market is open from 10am - 4pm showcasing a remarkable array of talented, enterprising artists and entrepreneurs. wind chimes, children's books, gourmet foods, are among the treasures already scheduled for the Market. Join us in support of these independent Masters of the Craft. Enjoy the talk and shop the walk with an abundance of wares made especially for you! In the market to Market? Space is available. I/We hereby make application for the June 25, 2011 rental of Artist/Craft space as specified below. I/We understand I/We Am/Are responsible for the reporting of all taxes as required in conjunction with all sales. I/We will provide all tables, chairs, tents/sun umbrellas as necessary for proper display and sale of items. The Art or Craft presented for sale is identified in the space provided below. Please be advised of the requirements to ensure participation in the Summer Solstice Spectacular event! Checks/money orders are to be made payable to Enjoy Bellevue and may be mailed or hand-delivered by June 22, 2011 to Enjoy Bellevue, 18 Hawley Avenue, Bellevue, PA 15202 We are also able to accept online payment of the Artist/Craft space via PayPal. Click the "Pay Now" to access your secure account. Click Pay Now to complete the secure transaction online with a debit or credit card. The completed Artist/Crafter application is due on or before June 22, 2011. There is no rain date for this event. Requested withdrawal from participation in the event after June 22 is unfortunately, nonrefundable. For additional information, e-mail info@enjoybellevue.org or contact 412-761-5773 during normal business hours. Feel free to leave a message. Your call will be returned, and your e-mail answered. This Craft Market is located in the Bellevue Borough Municipal Parking lot situated between Hawley and North Sprague Avenues. All spaces/booths are 10' x 10' as marked. All spaces are $15.00 each. The hours for the sale are 10am to 4pm. Set-up of booths/tables will be permitted beginning at 8am. No vehicles may remain in the parking spaces for the duration of the sale. Exhibitors are encouraged to park their vehicles in the South Sprague Avenue lot to allow for customer traffic to park along Lincoln Avenue and the immediate area. Vehicles may return to the vicinity of the lot at 4pm. All crafters please vacate the lot by 6pm. Exhibitors are asked to be patient and numbered vouchers will be issued to all to gain admittance to the lot area at the conclusion of the event. The spaces are available to artists and crafters. Exhibitors may set-up their space in a configuration of their choice. However, they may not impose on the space of another exhibitor or restrict access to another exhibitor. Exhibitors are responsible for the security of their items. The lot is gently sloping and this factor should be considered in the exhibitor’s display. No electricity is available for any of the spaces. No open-container alcoholic beverages are permitted on site. Food items will be permitted under certain circumstances and may require registration of several spaces. Spaces are available on a first come, first serve basis. Spaces must be reserved and pre-paid by June 22, 2011. Cash and checks made payable to Enjoy Bellevue are acceptable forms of payment. All NSF checks are subject to an additional charge of $35.00. Checks are deposited prior to the event. Exhibitors will not be entitled to a refund for withdrawal from participation in the event after June 22, 2011. 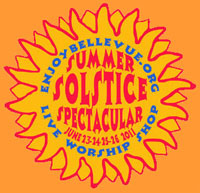 WE LOOK FORWARD TO YOUR PARTICIPATION IN THE SUMMER SOLSTICE SPECTACULAR 2011 ARTIST/CRAFT MARKET! Enjoy Bellevue - a creative community collaborative non-profit organization operating entirely as a distinctly independent financial entity separate from Bellevue Borough.